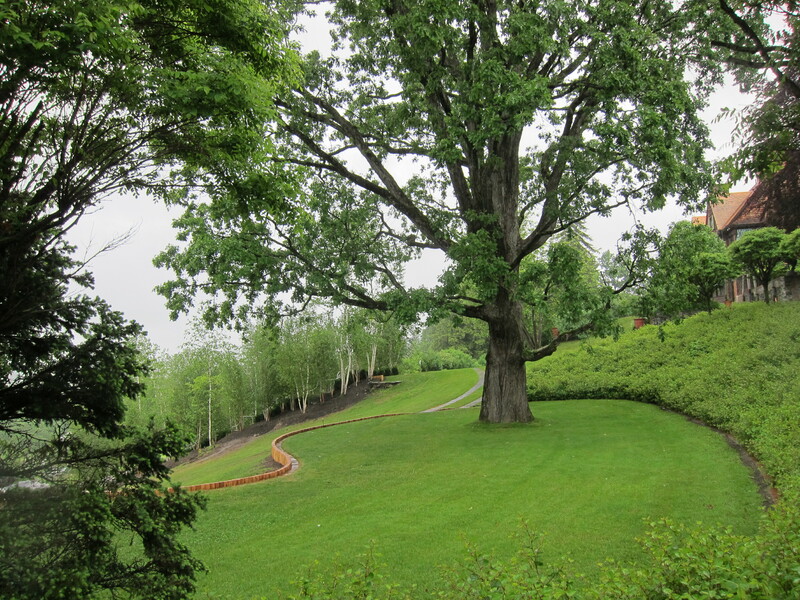 Last Friday, June 7, The New England Landscape Design and History Association (NELDHA) organized with The Trustees of Reservations (TTOR) a Preservation Workshop at Naumkeag in Stockbridge, MA. I drove the two hours there (and back again) through the heavy rains pelted down by Hurricane Andrea to attend. I’m glad I did. It was a memorable event. The Workshop had an outstanding ensemble of experts to speak. These included Mark Wilson, Curator of Collections and West Region Cultural Resources manager for the TTOR (who gave the excellent morning lecture and garden tour), Lucinda Brockway, Program Director for Cultural Resources at TTOR (the woman has such a vast wealth of knowledge and experience I could listen to her for days), Margie Coffin Brown, senior project manager at the National Park Service Olmsted Center for Landscape Preservation, and Phyllis Andersen, landscape historian. 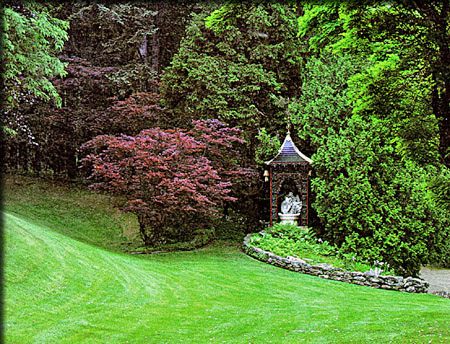 Naumkeag is the name given to the house, gardens and estate of Joseph Choate. The 1887 house is a Shingle Style house designed by renowned architect Stanford White of McKim, Mead & White fame. 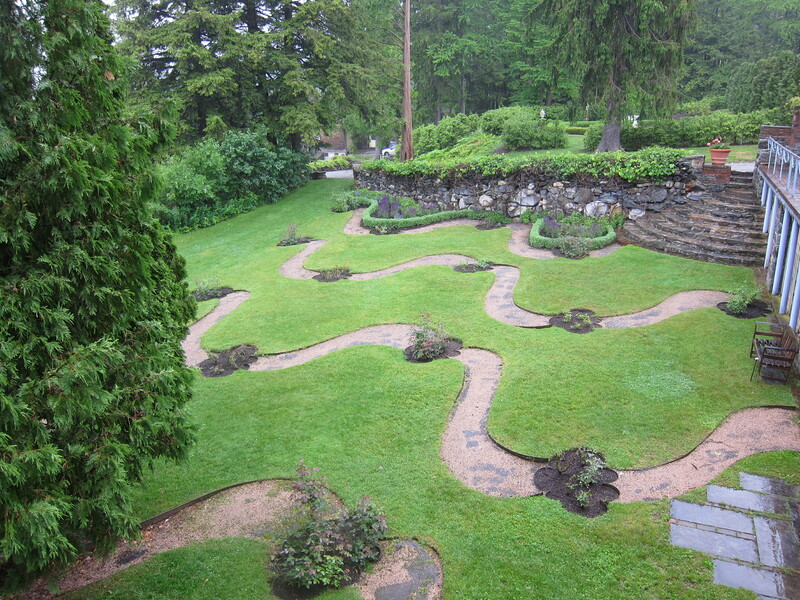 The house is beautiful and impressive, but it is the gardens that took me to Naumkeag. There are 8 acres of terraced gardens and landscaped grounds nestled among 40 other acres of woodland, meadow and pastures. 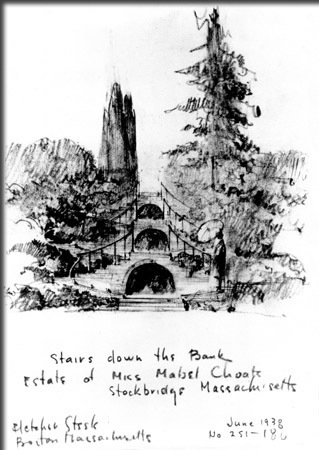 The gardens – including the Afternoon Garden, The Chinese Garden, the Tree Peony Terrace and the Blue Steps – are the justly famous result of a 30-year collaboration between Mabel Choate, the daughter of the original owner, and Fletcher Steele, the highly original American landscape architect. 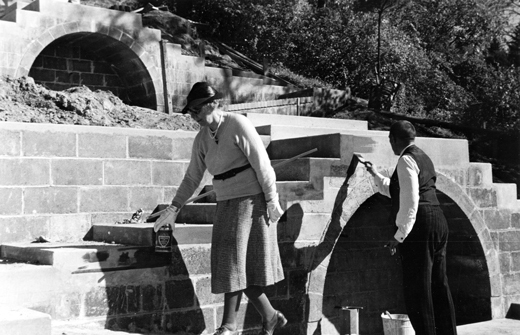 The creation of Naumkeag’s gardens was Mabel Choate’s life goal, and she chose Fletcher Steele to help her realize it. 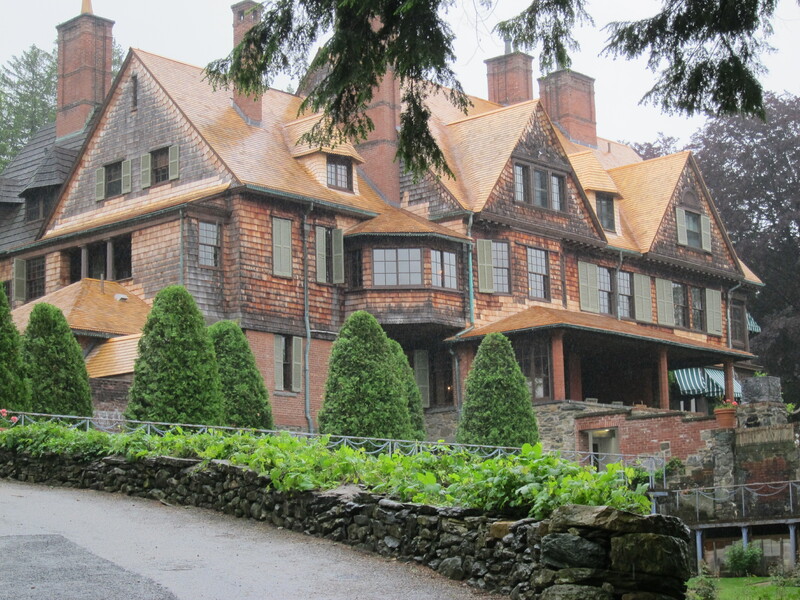 Upon her death in 1958 Miss Choate left all of Naumkeag to TTOR. Recently an anonymous benefactor gave TTOR a million dollars (!) to restore the gardens. The one stipulation of the donation was that the renovation was to begin immediately. 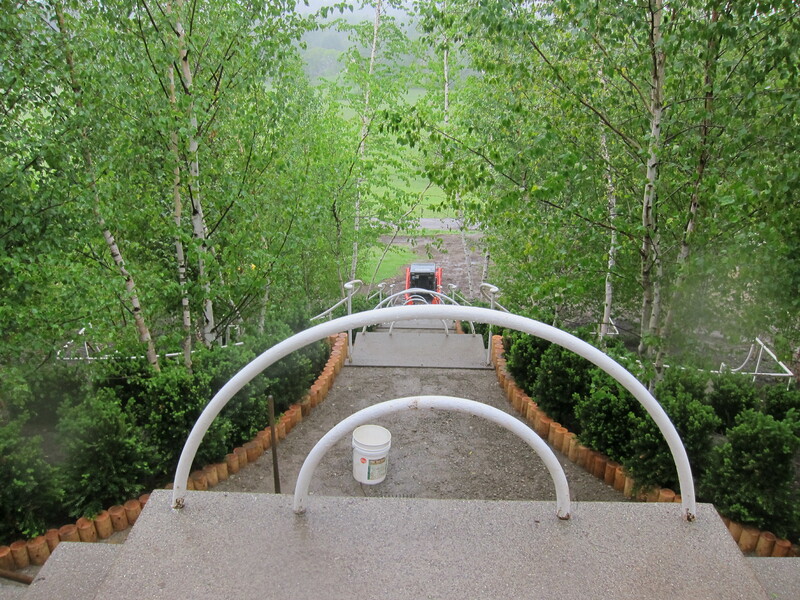 So, in the fall of 2012, within months of receiving the donation, Phase I of restoration began with the Blue Steps. 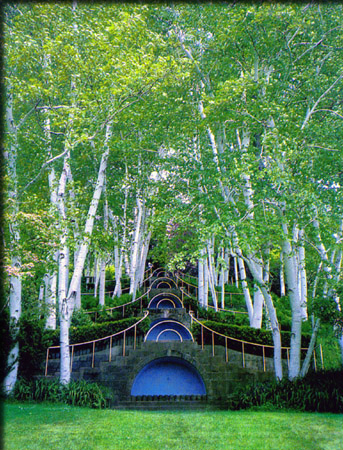 It has been claimed that Fletcher Steele’s Blue Steps are one of the most recognizable images in American Landscape Architecture. Chances are that even if you do not know where the Steps are or who designed them you will have seen a picture of them at least once. Is this true for you? The stairs themselves are structurally sound so aside from some repointing the actual stairs were not in need of restoration. 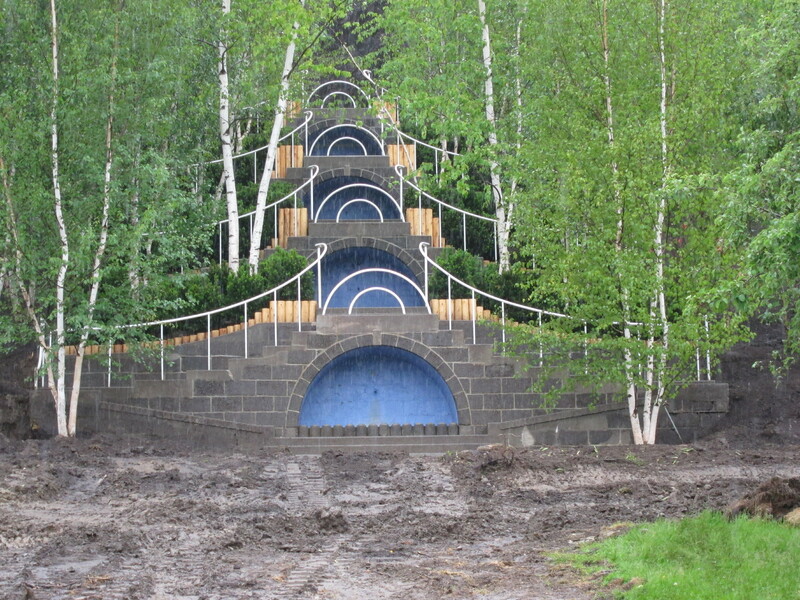 The white birches and the yew hedges, however, have all been replaced. Steele planted over 75 white birches in 1938. 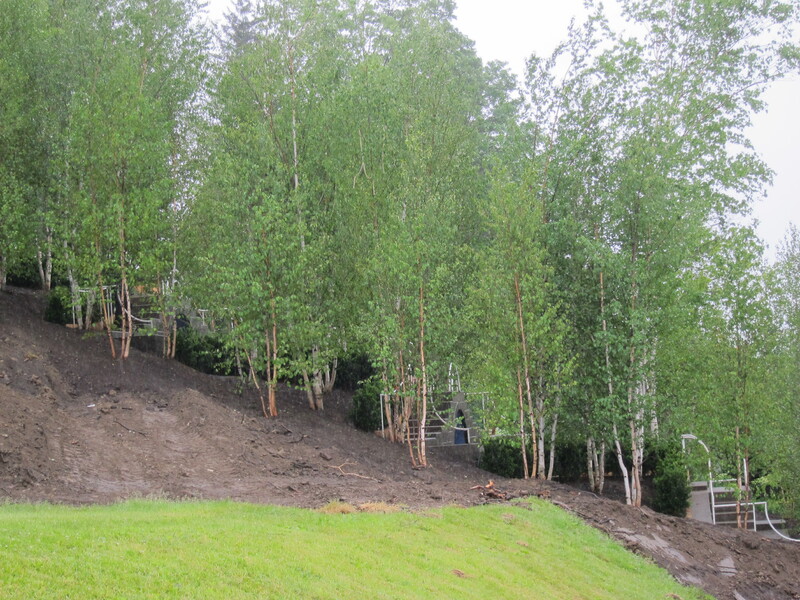 Before restoration began there were only 30 birches left flanking the Steps, of which only 6 are thought to be original. Steele was a meticulous note taker and letter writer so his archives provide a wealth of information that the restorers are using to recreate his designs. 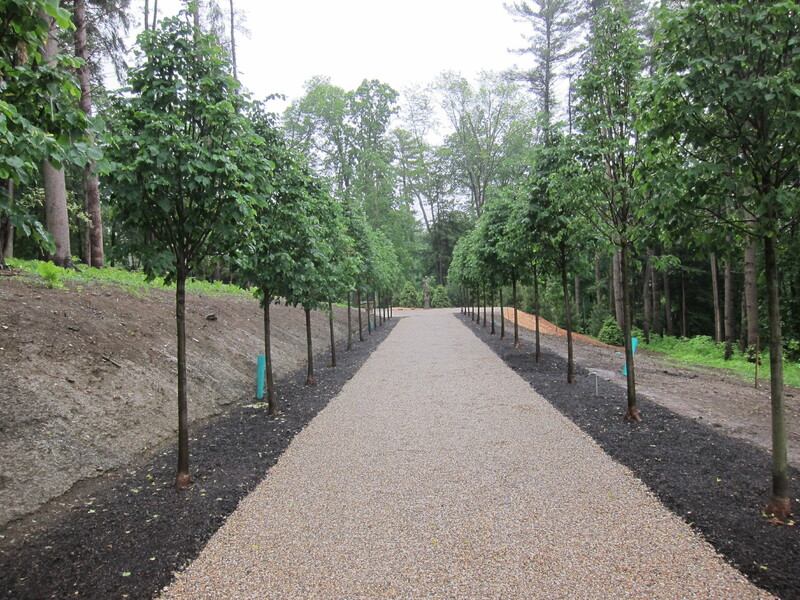 For the placement of the white birches, a note exists saying that Steele did not work out the exact placement of the birches before planting. 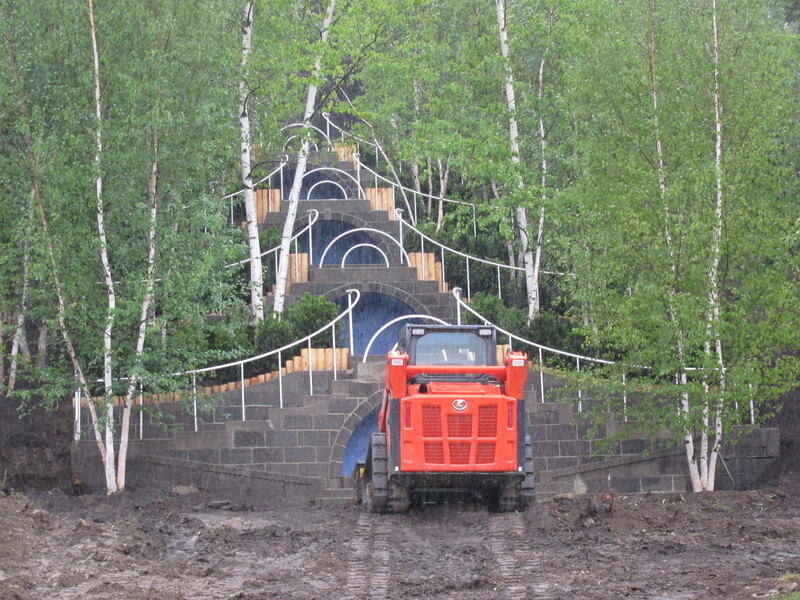 During installation Steele directed the placement of each birch as it went in. The restorers did the same, only they also used photographs from 1938 to help with the placement of the birches. 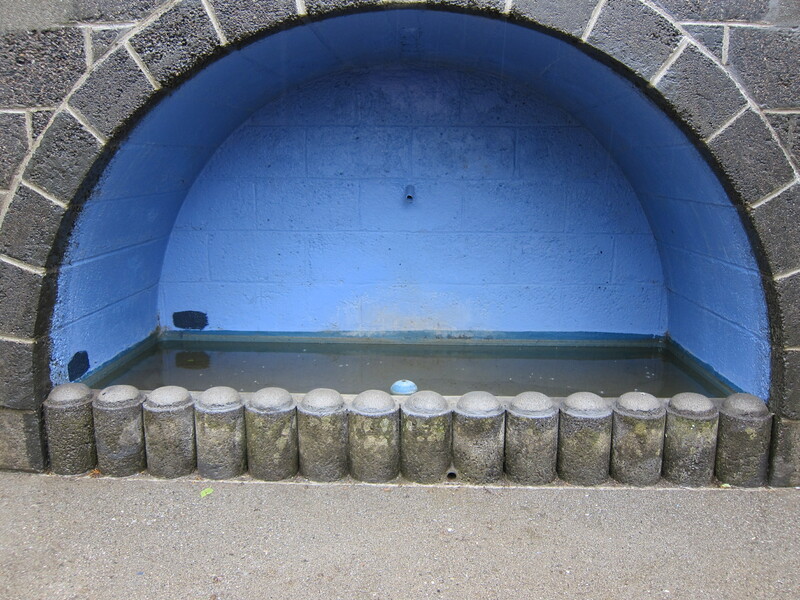 During restoration, the original blue color was discovered. The original blue is closer to a blue black then the present bright blue. The restorers are in the process of recreating the original color, which, once they have the color correct, will be painted over the bright blue. Other areas of the garden which have been restored are the Linden Alley and the Pavilion. 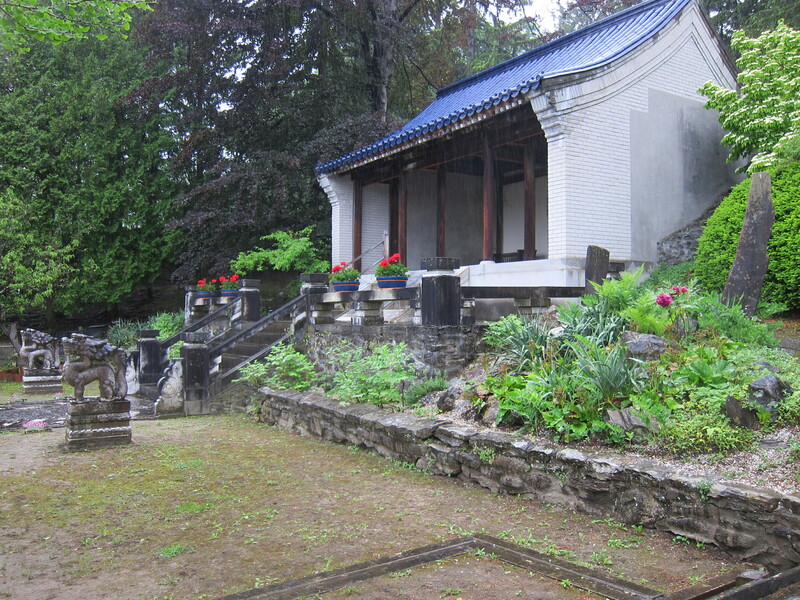 The Chinese Garden, the Afternoon Garden and the Rose Garden will be restored in later phases. 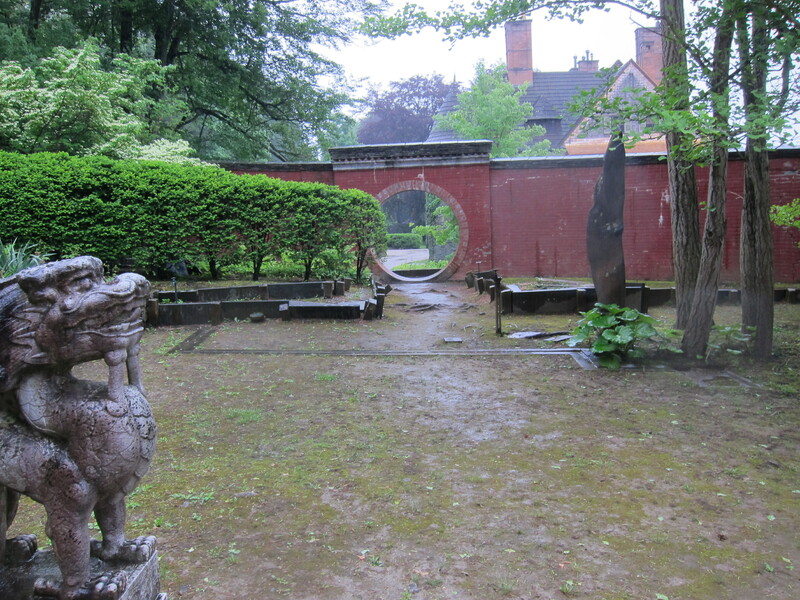 It wasn’t a pretty day for a garden tour, and the gardens of Naumkeag are not at their best this year what with all the disruption and detritus of a restoration. Nevertheless, it is a banner year to visit Naumkeag. 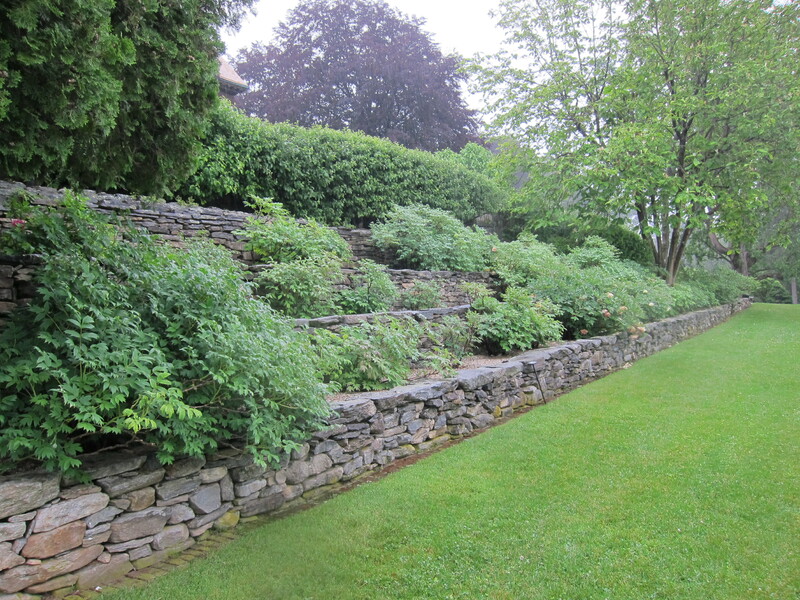 The restoration at Naumkeag is an excellent example of a garden restoration done properly. The Blue Steps and other areas of restoration look wonderful (even through all the rain) and the areas slated for restoration can be seen now, before they are restored. 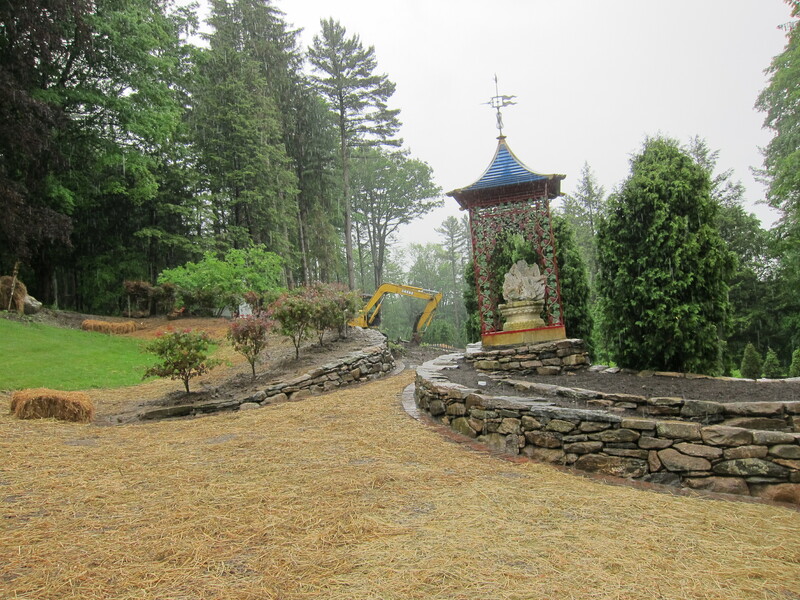 I plan on returning multiple times to witness the progress of the restoration, and to see the grass grow once again below Fletcher Steele’s famous Blue Steps at Naumkeag. What a lovely surprise to see your photo/story on Naumkeag! I visited the property in July 2008, also on a rainy day, and was very impressed with the scope of the gardens and the early stages of restoration of the house. Thank you for showing us the work accomplished to date. Hope you get to go back and see the stunning restorations. I too hope to visit the garden one day, your description is so enchanting I can’t wait to get there. I looked on a map and it looks as though it is only an hour or so from Boston, a city which I hope to visit later this year. Thank you for writing about this, and educating me about it. It would be nice to meet you to! it is very beautiful, and something I had not realized was there before finding this article. I hope to go visit sometime when I am next in the Berkshire mountain area of Massachusetts, but it is at least a 2 hour drive from Boston. Welcome, Margaret! Thank you for taking the time, and having the interest, to visit and comment on ofgardens. It is very nice of you to be concerned about Fred…I hope he reads your post and appreciates the thoughtfulness. Two of the (many) things that attracted me to landscape design are at Naumkeag: the Blue Steps and the delightfully rococo rose garden. When I visited Naumkeag some years ago, I was not disappointed. I’m thrilled to know that restoration is underway, and being done so thoughtfully. Definitely it warrants a return visit. I hope you get to return and see the restoration. Definitely worth a return visit.